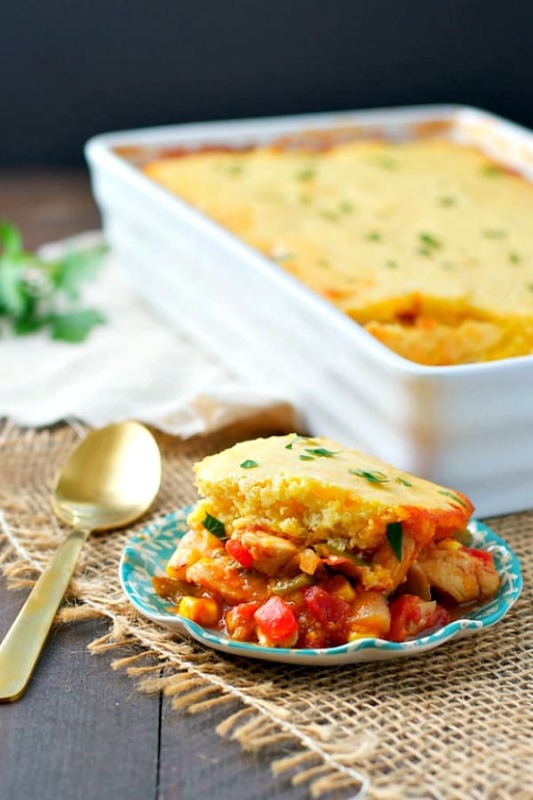 A Cheesy, sweet and tangy cornbread casserole made with barbecue chicken and a crispy cornbread topping. This Barbecue Chicken Cornbread Casserole is an easy dinner recipe that comes together with a few pantry staples in just 15 minutes! 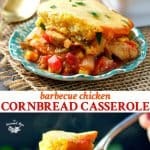 Made with sweet and tangy barbecue chicken and a cheesy crispy cornbread topping, so delicious! 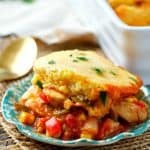 This Barbecue Chicken Cornbread Casserole was the latter – a last-minute easy dinner that I threw together when I was looking into a very bare refrigerator with 3 very hungry little boys staring at me across the counter. I literally pulled together each of these ingredients from my cabinets, freezer, or refrigerator and dinner was in our bellies about 45 minutes later. Can’t beat that! 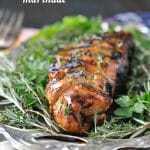 Easy, Fuss Free and Delicious! 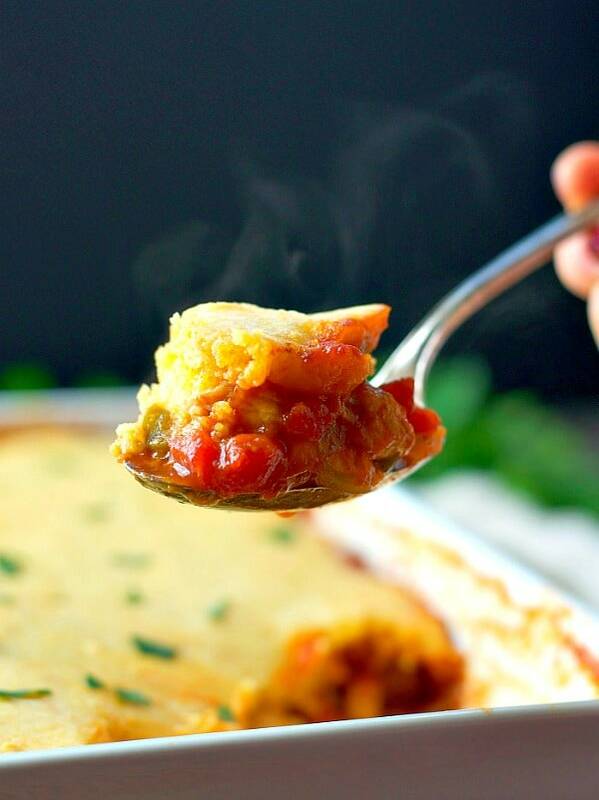 Best of all, the Cornbread Casserole is a complete meal in one pan. 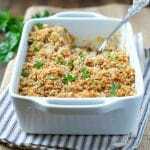 You don’t have to scramble to pull together a side dish or veggies at the last minute, since the filling is loaded with plenty of bell peppers, onions, tomatoes, and corn. A small amount of leftover (or rotisserie) chicken goes a long way and adds a protein boost; or you can substitute a can of beans for the meat and create a vegetarian option. It’s cheesy, it’s sweet, it’s tangy, it’s filling, it’s comforting, and it’s finished with a delicious cornbread crust! I hope that your family enjoys this supper as much as mine does, and I hope that it saves you from at least one stressful trip to the grocery store! Preheat oven to 350F (180C). Spray an 11 x 7-inch baking dish with cooking spray and set aside. Heat 1 tablespoon of olive oil in a large skillet over medium-high heat. Cook onion and bell pepper just until tender (about 3 minutes). Reduce heat to low, add barbecue sauce, and simmer until thickens slightly (about 1-2 minutes). 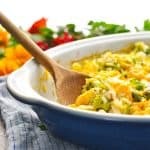 Stir in frozen corn, tomatoes, chicken, and ½ cup of the cheddar cheese. Transfer chicken mixture to prepared baking dish. In a separate bowl, prepare cornbread batter according to package instructions. Stir in remaining ½ cup of cheese. Spread cornbread batter over chicken mixture. I like to do this by using a large spoon to dollop the batter all over the top of the casserole. Then use the back of the spoon to gently spread it around until it covers most of dish. Bake for 30-35 minutes, or until crust is golden brown and cooked through. Previous Post: « Meal Prep: How to Pack School Lunches on Sunday that Stay Fresh All Week! 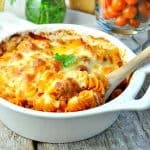 This casserole is totally calling my name! As in, I want it for breakfast! 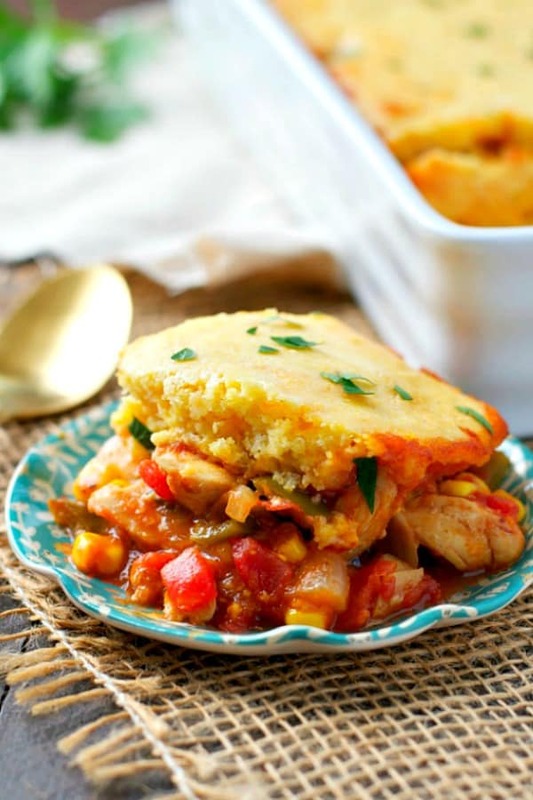 🙂 I have a major thing for cornbread, and I love that you layered it on top of barbecue chicken. 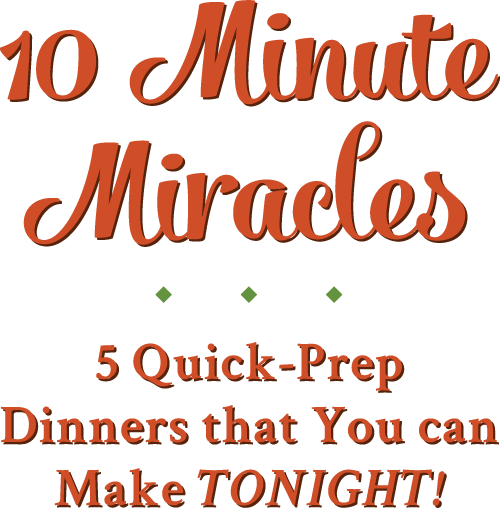 What a perfect meal for busy weeknights! Thanks, Gayle! It’s full of so much flavor — and I love the cornbread crust the most, too! Yep, this is totally a crowd-pleaser! I love cornbread too, and my boys are all about the BBQ chicken. We love this dinner! You are so creative!! I love how you threw this all together and came up with the perfect family meal! 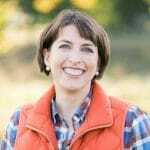 Thank you, Kelly! Have a great weekend! Jiffy cornbread mix is my FAVORITE. This looks like the best use of it…ever! Well, this will go right to the top of the Southern husband’s list of favorites (and I think I will love it too!) Hurray! Awesome. I hope that you both love it, Kate! Oh, you’re so welcome, Norma! I hope that you enjoy it! We love that meal! 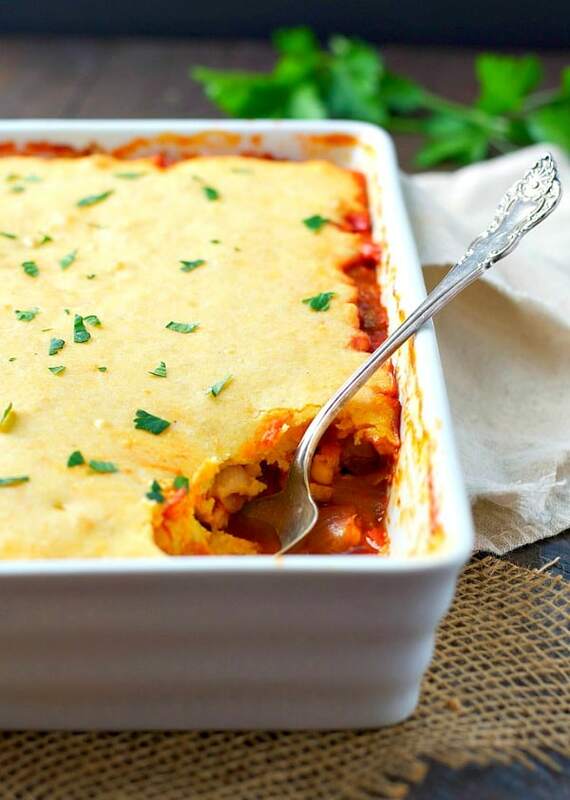 Fabulous, delicious comfort food. We LOVED IT!